Adults in the United States spend 3 hours and 48 minutes on their computers, smartphones, and tablets every single day.1 In fact, you’re probably reading this explainer on one of those three devices right now. And to get to this document’s webpage or, for that matter, Netflix, Twitter, ESPN, or Instagram, consumers want to make sure they can surf online fast and access whatever they want when they want. While the concept may sound simple, the debate in Washington has been far from that. The rules that govern this space have shifted back and forth, as the Federal Communications Commission (FCC) has tried to figure out what it can and should do to protect consumers. Currently, the FCC has removed explicit rules barring ISPs from blocking or throttling traffic. Instead, they have chosen to only require ISPs to disclose how they handle consumers’ traffic and rely on Federal Trade Commission (FTC) enforcement if ISP practices violate those terms.3 States and other policymakers have reacted to this decision, and the debate of how this area should be regulated continues. To help policymakers understand this issue and engage in the current legislative discussions on the topic, this memo unpacks the consumer protections being discussed, the regulatory framework up for debate, and some brief background on how this issue has evolved. Blocking refers to the ability to prevent a consumer from accessing certain legal websites and content providers.4For example, under blocking, an ISP could stop a consumer from accessing a competitor’s website. It should be noted that many internet companies have overtly stated they would not practice blocking—highlighting that they would have no incentive to do so in a competitive market for consumers. Throttling is the ability to slow or interfere with the transmission of content to a consumer.5 For example, an ISP that is throttling might allow a consumer to access a particular website but only at a slower speed or lower-quality transmission. Consumer advocates warn that internet providers can slow access to companies that do not pay for prioritization as a way of punishment. Like blocking, most internet providers have explicitly pledged not to throttle or censor any online content, pointing again to their desire to compete with other providers to provide speedy access to anything consumers demand. Consumer advocates argue that if content providers can pay for faster internet speeds, it unfairly penalizes smaller companies and startups who may not have the funds to do so. As a result, they argue that consumers could see less content, and fees could also trickle down to the consumer. ISPs argue that they lack incentives to engage in harmful paid prioritization since consumers can shift to alternative providers if the content they wish to access is restricted. Many ISPs have committed that they will not accept payment to deliver internet traffic to consumers faster or sooner than other internet traffic. They also argue that they need some reasonable flexibility to manage traffic on their networks to avoid congestion for customers (e.g. treating video streaming differently than uploading a photo to a social media account). Transparency refers to requirements that ISPs must disclose how they manage their networks.7Currently, the FCC requires ISPs to include disclosures on any blocking, throttling, or paid prioritization that internet service providers might practice. Transparency rules have been included in past net neutrality regulations, but play an even larger role in the absence of net neutrality. There is fairly widespread acceptance of the need for transparency. However, consumer advocates argue that relying on FTC enforcement alone is not a strong enough regulation, and there needs to be additional rules authorizing direct FCC enforcement of “bad practices” such as blocking or throttling. Consumer advocates argued that this general conduct standard would ensure that the FCC could prevent ISPs from finding loopholes. However, ISPs countered that the standard was ambiguously worded and would effectively allow the FCC to create new rules well beyond the scope of Congress’s original intent. Under the current rules, there is no longer a general conduct rule. However, the Federal Trade Commission can investigate entities it believes are engaging in deceptive or misleading practices, and the FCC can investigate ISPs that are not abiding by transparency obligations. Behind the scenes of the consumer protections noted above is a roiling debate over the regulatory framework and legal authority that the government uses to stand up and enforce those protections. It’s important to know that net neutrality regulation is rooted in the federal laws that shape the FCC’s jurisdiction. The basis of the telecommunications rules and regulatory structure began in 1934 with the creation of the FCC. Established through the Communications Act of 1934, the FCC was tasked with overseeing and regulating telephone, telegraph, and radio communications (later updated to include broadcast, cable, and satellite television).10 At the crux of today’s debate are the differences between two regulatory frameworks established by this law: Information Services (referred to as Title I) vs. Telecommunication Services (also known as Common Carrier services and referred to as Title II). 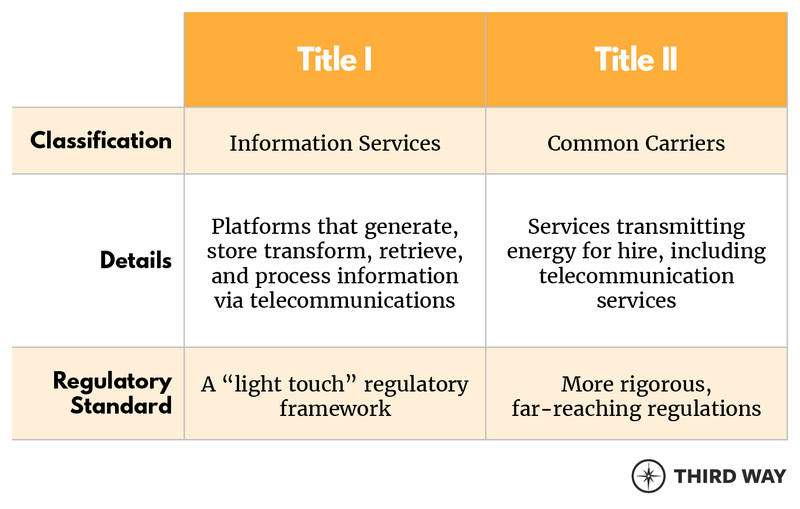 Title I of the Act defines information services as platforms that generate, store, transform, retrieve, and process information via telecommunications. Notably, this classification is often associated with a lighter form of regulatory oversight. Title II of the Act defines a common carrier as any service transmitting energy for hire, including telecommunication services.11 Common carrier regulation arose out of the regulation of railroads, whereby the government gave railroads access to the public right of way in exchange for obligations to provide access to the public. Under the common carrier designation, a service faces more rigorous regulations, most similar to telephone, gas, and electric providers.12 This includes price regulation and rules concerning the introduction of new services and the discontinuance of old ones. Since its passing, Section 706 has sparked much controversy and debate—and has been challenged multiple times in court.16 In 2010, the DC Circuit Court found that the FCC could rely on Section 706 as a source of authority to regulate and enact open internet rules. Knowing that, unless Congress intervenes, the future of net neutrality laws rests on the previously discussed classifications: information services vs. common carriers. While the FCC has the authority to promote internet openness, the Communications Act of 1934 still prohibits certain regulations on services deemed “information services.” Settling the debate of authority has brought us to where we are now: how do we classify Internet Service Providers? In 2010, the FCC adopted official net neutrality rules in an Open Internet Order. Some refer to this as “Obama Plan A” since it was adopted by an FCC Chairman appointed by President Obama. The Order established rules for ISPs in hopes of creating a neutral network. Specifically, the order required transparency from internet providers and prohibited blocking and unreasonable discrimination of content.21 To monitor these rules, the FCC created an Open Internet Advisory Committee to oversee the effects of the Order and continue to build on best internet practices. In adopting these rules, the FCC retained the classification of broadband services as information services and rooted their authority to oversee ISPs in Section 706 of the 1996 Telecommunications Act. The DC Circuit Court subsequently upheld the order, making these net neutrality regulations law from 2015-2017. Governors in Hawaii, New Jersey, New York, Montana, Rhode Island, and Vermont have issued executive orders stating that any internet service contracts awarded by the state will go to providers that adhere to net neutrality principles.29 Vermont’s executive order and statute have been challenged in federal court, and the state has agreed to hold off enforcement for the time being. Both consumer advocates and ISPs want to bring back and codify protections such as no blocking, throttling, or paid prioritization—but there is disagreement over additional provisions as well as the regulatory framework to be used. Overall, the conversation surrounding net neutrality remains fluid and ever-changing. Without specific congressional action that would end the uncertainty around this issue, we will likely see the debate continue through pending legal action, ultimately coming down to three critical issues: state’s rights, the FCC’s authority, and the classification of broadband internet access providers. Fottrell, Quentin. “People spend most of their waking hours staring at screens.” MarketWatch, 4 Aug 2018. https://www.marketwatch.com/story/people-are-spending-most-of-their-waking-hours-staring-at-screens-2018-08-01. Accessed 20 March 2019. Finley, Klint. “The Wired Guide to Net Neutrality.” Wired, 9 May 2018. https://www.wired.com/story/guide-net-neutrality/. Accessed 20 March 2019. Fung, Brian. “The FCC’s net neutrality rules are officially repealed today. Here’s what that really means.” The Washington Post, 11 June 2018. https://www.washingtonpost.com/news/the-switch/wp/2018/06/11/the-fccs-net-neutrality-rules-are-officially-repealed-today-heres-what-that-really-means/?utm_term=.ff44e2736892. Accessed 20 March 2019. Collins, Keith. “Net Neutrality Has Officially Been Repealed. Here’s How that Could Affect You.” The New York Times, 11 June 2018. https://www.nytimes.com/2018/06/11/technology/net-neutrality-repeal.html. Accessed 20 March 2019. Puzzanghera, Jim. “The neutrality’s repeal means fast lanes could be coming to the interney. Is that a good thing?” The LA Times, 13 Dec 2017. https://www.latimes.com/business/la-fi-net-neutrality-fast-lanes-20171213-story.html. Accessed 20 March 2019. Marashlian, Jonathan. “Transparency is FCC’s Remaining Method of Enforcing Net Neutrality.” Marashlian & Donohue, PLLC, 16 Jan 2018. https://commlawgroup.com/2018/transparency-is-fccs-remaining-method-of-enforcing-net-neutrality/. Accessed 20 March 2019. United States, Federal Communications Commission. “Open Internet Order.” https://transition.fcc.gov/statelocal/presentations/Open-Internet-Order.pdf. Accessed 20 March 2019. United States, Department of Justice. “The Communications Act of 1934.” https://it.ojp.gov/privacyliberty/authorities/statutes/1288. Accessed 20 March 2019. United States, Congress. Communications Act of 1934. https://transition.fcc.gov/Reports/1934new.pdf. Accessed 20 March 2019. United States, Federal Communications Commission. “Telecommunications Act of 1996.” https://www.fcc.gov/general/telecommunications-act-1996. Accessed 20 March 2019. United States, Congress. Telecommunications Act of 1996. https://transition.fcc.gov/Reports/tcom1996.pdf. Accessed 20 March 2019. Adler, Jonathan. “Divided D.C. Circuit upholds FCC ‘net neutrality’ rule.” The Washington Post, 14 June 2016. https://www.washingtonpost.com/news/volokh-conspiracy/wp/2016/06/14/divided-d-c-circuit-upholds-fcc-net-neutrality-rule/?utm_term=.539f41f801dd. Accessed 20 March 2019. Reardon, Matguerite. “Net neutrality: How we got from there to here.” CNET, 24 Feb 2015. https://www.cnet.com/news/net-neutrality-from-there-to-here/. Accessed 20 March 2019. United States, Federal Communications Commission. Policy Statement, 23 Sept 2005. https://docs.fcc.gov/public/attachments/FCC-05-151A1.pdf. Accessed 20 March 2019. Gilroy, Angele. “The Net Neutrality Debate: Access to Broadband Networks.” Congressional Research Service, R40616, 30 Jan 2019. https://crsreports.congress.gov/product/pdf/R/R40616. Accessed 20 March 2019. Fung, Brian. “These are the 2019 court fights that will decide the future of net neutrality.” The Washington Post, 2 Jan 2019. https://www.washingtonpost.com/technology/2019/01/02/these-are-court-fights-that-will-decide-future-net-neutrality/?utm_term=.b1f0e7fe6cab. Accessed 20 March 2019. Kelly, Heather. “California just passed its net neutrality law. The DOJ is already suing.” CNN, 1 Oct 2018. https://www.cnn.com/2018/10/01/tech/california-net-neutrality-law/index.html. Accessed 20 March 2019. Morton, Heather. “Net Neutrality Legislation In States.” National Conference of State Legislatures, 23 Jan 2019. http://www.ncsl.org/research/telecommunications-and-information-technology/net-neutrality-legislation-in-states.aspx. Accessed 20 March 2019.